Tougher, stronger, and loaded with innovation, our 2015 Ford F-150 XLT SuperCab 4X2 in Ingot Silver has been engineered with a high-strength military grade aluminum-alloy body and a high-strength steel frame to increase capability and efficiency! Powered by a potent 5.0 Liter V8 offering 385hp while tethered to a durable 6 Speed Automatic transmission with Sport and Tow/Haul modes. No matter how grueling your day, this Rear Wheel Drive helps you enjoy near 22mpg on the highway and have the muscle to haul or pull massive loads! 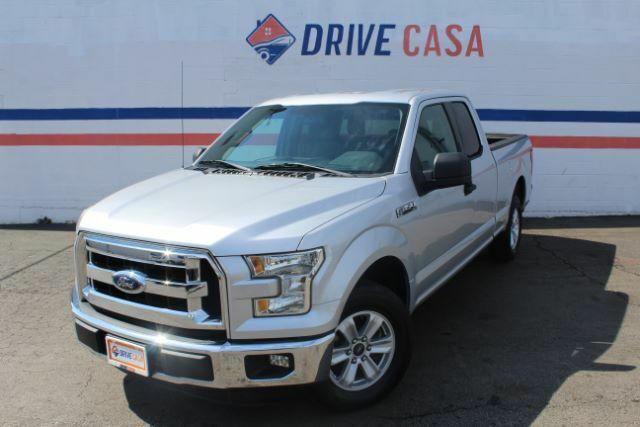 Dominate the road in this Ford F-150 XLT that is both modern and aerodynamic in design with chrome trim, fog lights, and prominent alloy wheels. Inside this well thought out XLT, find clever storage, power accessories, and comfortable cloth seats. Stay safely connected thanks to Ford''''s Sync voice control smartphone integration system, while taking advantage of Bluetooth phone/audio connectivity and USB/auxiliary audio input jacks for the sound system. Buckle-up and enjoy this solid, composed ride! Here at Drive Casa we pride ourselves on customer service and quality vehicles. As one of the premier Buy Here Pay Here dealers in Texas, we are passionate about helping people with poor credit or no credit at all get financed through our in-house program. Every vehicle comes with a 12 month/12,000 mile limited warranty. To top that, oil changes are on us for the first year of ownership! Stop by or call us today! We are here for you! Aqui en Drive Casa nos enorgullecemos de servicio al cliente y vehiculos de calidad. Como uno de los distribuidores principals de Buy Here Pay Here en Texas, nos apasiona ayudar a las personas con mal credito en lo absoluto o ser financiados a traves de nuestro programa interno. Cada vehiculo viene con una grantia limitada de 12 meses / 12,000 millas. Por encima de eso, los cambios de aceite estan a nuestro costo el primer ano de propiedad! Venga o llamenos hoy mismo! Estamos aqui para ti!